Beta-cryptoxanthin, which also has provitamin A activity, is present in few foods, among which mandarin stands out. Carotenoids are compounds that give the characteristic color to many fruits and vegetable products, such as citrus, but in addition to this, have important nutritional properties and beneficial to our health. Researchers Lorenzo Zacarías and María Jesús Rodrigo, from the Institute of Agrochemistry and Food Technology (IATA-CSIC), located in the Science Park of the University of Valencia, have been studying them for more than a decade. Specifically, their latest research focuses on beta-cryptoxanthin. "This pigment accumulates in very few plant products, including mandarin, and in addition to being pro-vitamin A, it appears to have certain antioxidant properties that we wanted to demonstrate. For this we needed an animal model to validate its functionality. We have achieved this by working together with the company Biopolis, which is also located in the Science Park", explains Zacarías. "Supplied to the nematode Caenorhabditis elegans, an animal model that shares a high percentage of its genes with humans, this antioxidant role is corroborated and it is also observed that it reduces the body fat of the worm by 30%", explains Patricia Martorell, researcher at the biotechnology company. The value of this study, published in the journal Nutrients, lies in the first place in the fact that, within the scarce amount of fruits that contain it, "the majority are cultivated in the Mediterranean area, and among them, the star food is mandarin. In fact, the striking colour of its pulp is due to beta-cryptoxanthin", points out María Jesús Rodrigo, who adds: "Studies carried out in the European population show that there is a clear increase in this carotenoid in the blood plasma coinciding with the autumn and winter seasons, precisely the season of mandarin consumption". This carotenoid is also found in persimmon, medlar and red pepper, and in tropical fruits such as papaya. Secondly, the results of this study show that "beta-cryptoxanthin does not lose its bioactivity in the organism of the nematode when it is extracted -for example, from mandarin juices- and added to other fundamentally liquid food matrices, such as lactic ferments, skimmed milk, soft drinks or juices; in all of them it has maintained its fat-reducing effectiveness", indicates Patricia Martorell. "This result is very interesting from an applied point of view because it points to a potential development of products for the food industry, which could incorporate this carotenoid or extracts of it in matrices and supplements," adds Martorell. In addition, the results of this study "delve into the cellular mechanisms that are triggered after ingestion, thus opening new opportunities to understand their role in the prevention of diseases related to the metabolic syndrome and aging," indicate from IATA and Biopolis. However, all of them qualify, "now it is convenient to validate these results with preclinical research in murine models - rat or mouse - where there are adequate models for obesity, and later to carry out clinical studies in humans". In Biopolis, the nematode C. elegans has been used for 12 years as a simple organism for the functional evaluation of ingredients. "Among its main advantages, it is worth mentioning its easy cultivation in the laboratory and also the fact that it conserves a high percentage of its genome in humans", underlines the Biopolis researcher. 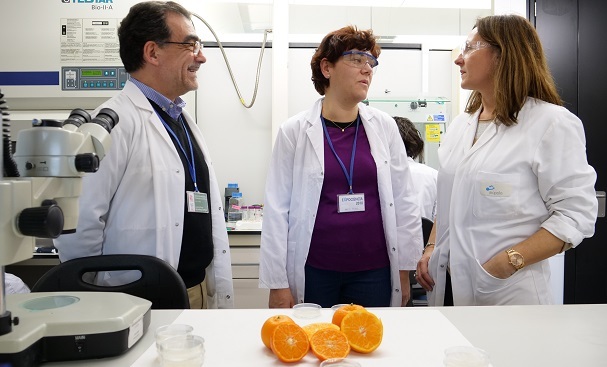 Likewise, Lorenzo Zacarías and María Jesús Rodrigo, specialists in studying the nutritional, organoleptic and commercial quality of citrus fruits, warn that the nutritional value of these compounds should not be understood as "substitutes for drugs. The beneficial effects of the components of the fruits, which in this case help to control body fat, are neither curative nor therapeutic. The beneficial effects of mandarin in this case should be understood in a sense of prevention, risk reduction. Along these lines, they also stress that this type of research, in which the nutritional or health-enhancing value of foods or ingredients is studied by means of contrasted models, allows scientific support to be given to the claims required by the European Union to publicise the characteristics of food components. "With this type of studies, with concrete scientific data backed by rigorous experimentation, commercial strategies based on scientific data can be developed and misleading advertising avoided," they point out.